How could I pass up not joining this group of bloggers. 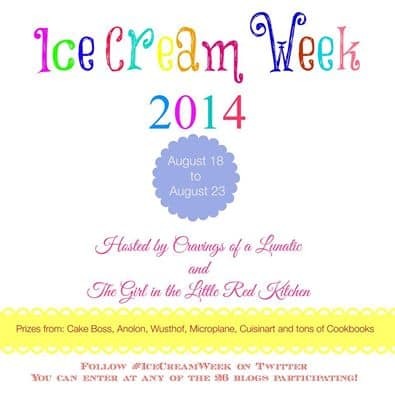 #IceCreamWeek was a must to enter!! Amber, our daughter totally agreed and quickly made up my list of “must have” makes!!! This first ice cream is one of her new favorites, Salted Caramel Ice Cream. 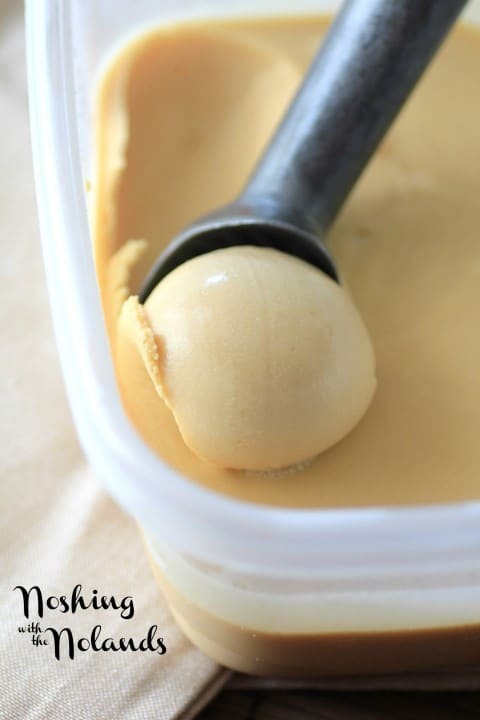 This is simple but must be creamy and smooth to be the perfect ice cream. I think I got it right!! The first batch of caramel was burnt, there is a fine line between just done and over done. It is easy to start again. I think the trick is to take it off the heat just before it is done as it continues to cook. You don’t need a lot of salt as the caramel enhances it nicely!! 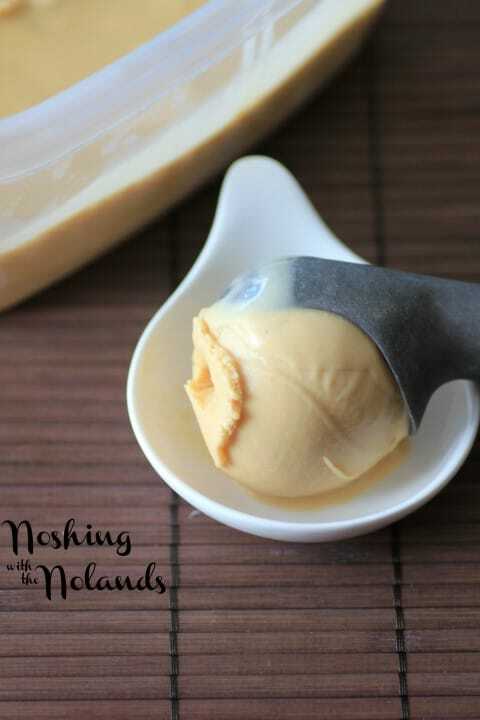 Rich and creamy and full of flavor, just what you want in a Salted Caramel Ice Cream!! One little scoop is enough to satisfy a big sweet tooth craving!! 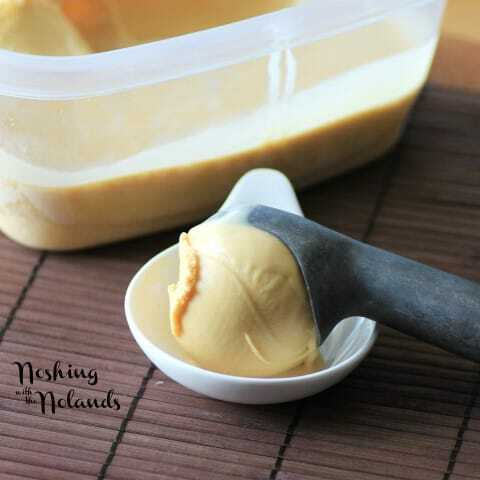 A rich and creamy ice cream treat with full on salted caramel flavor!!! ¾ cup sugar plus 2 Tbsp. In a heavy bottomed pot add the ¾ cup of sugar, the water and the lemon juice. Cook over medium-high heat. Stir with a wooden spoon until the sugar dissolves. Let the mixture continue to cook without stirring until it turns amber about 5-6 min. Careful as it will burn easily. If it does, discard and start again. Being very careful and wearing oven mitts add in ¾ cup of cream into the hot syrup. Stir with a long handled wooden spoon until smooth. Put the pot again over medium heat and cook until bubbles start to form around the sides. Remove from heat and set aside. Meanwhile, whisk the egg yolks with the salt, remaining 2 Tbsp. sugar and remaining ¼ cup of cream until smooth. Mix in the milk. Add the milk mixture to the warm caramel and again cook over medium heat until the custard coats the back of a wooden spoon. Do not let it boil but keep it at a low simmer, stirring constantly. This will take about 4-6 min. Strain through a sieve into a bowl. Add the salt and vanilla. Place first bowl into a large bowl filled with ice and stir occasionally until cooled. Cover with plastic wrap directly over the ice cream mixture to prevent a skin to form. Chill in the refrigerator for 3 hours to 24 hours. 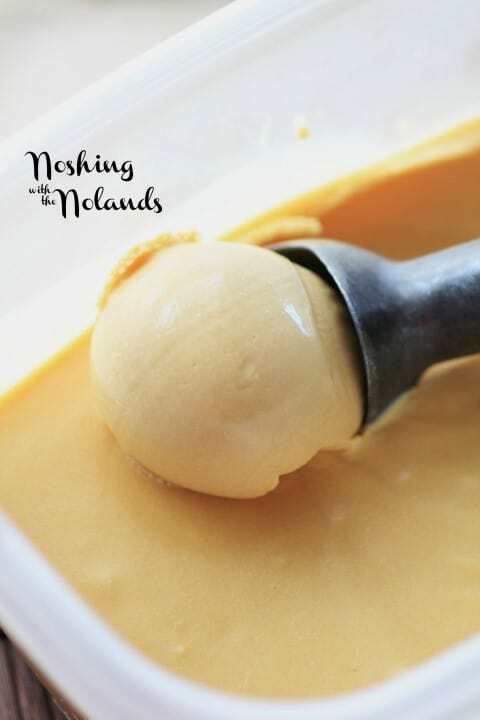 Pour the custard into an ice cream maker and follow manufacturers instructions to freeze. Transfer the frozen mixture to a freezer safe container and freezer for at least 3 hours or up to 3 days. Welcome to day 2 of Ice Cream Week 2014! This year the event is hosted by Kim of Cravings of a Lunatic and Susan of The Girl in the Little Red Kitchen. 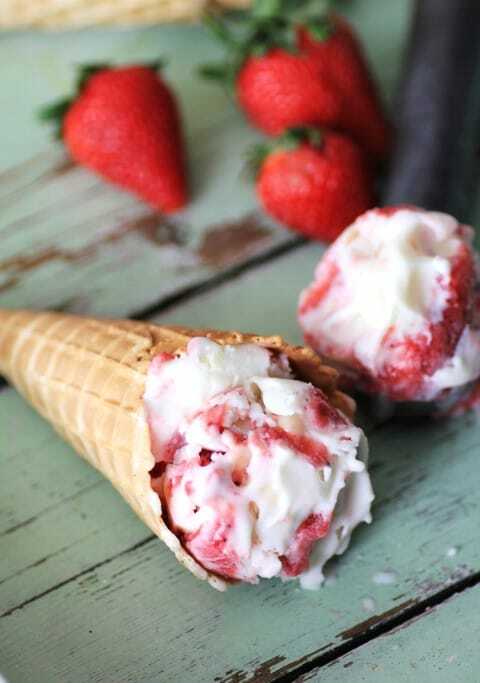 We have teamed up with 25 amazing bloggers to bring you ice cream treats all week long. It’s going to be an epic week full of frozen treats! Here are some of my delicious ice creams from the past, hope you enjoy them!! This one is amazing and is from our guest blogger and author of Scoop Adventures. I was lucky enough to review her ice cream cookbook and made this amazing Le’Lemon Berry Ice Cream. You have a chance to win her gorgeous cookbook in our giveaway!! 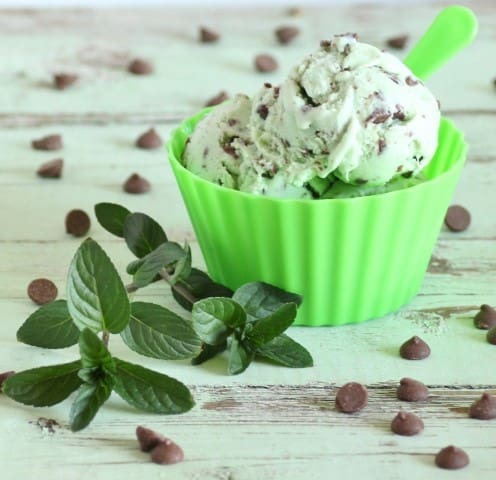 My daughter’s favorite ice cream, Mint Chocolate Chip. I have revamped this recipe into something else that you will see later this week!! 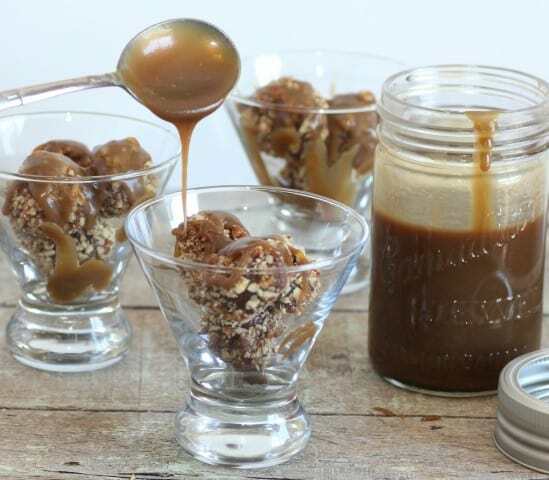 You can’t get much more decadent than Chocolate Ice Cream Pecan Balls with Salted Caramel Sauce. Loved everything about this ice cream dessert!! This is one of my favorite ice cream when it is made with a really good quality cinnamon. 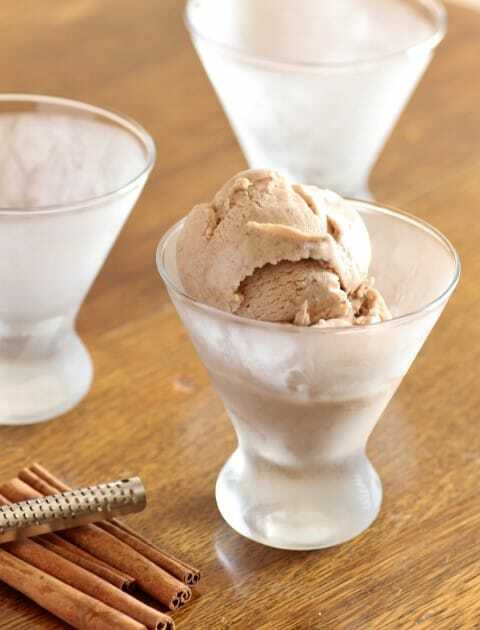 I have made Cinnamon Ice Cream many times to rave reviews!! The Ice Cream Week Giveaway is open to U.S. and Canada. It closes at midnight on 31st. It’s ONE WINNER TAKES ALL! Your Salted Caramel Ice Cream looks wonderful! Thanks for sharing. I’m checking several of the other ice cream posts you linked to also. This sounds absolutely heavenly! I bet it would be amazing with a chocolate shell! MMMM chocolate, thanks Rebecca for the idea!! Tara, this ice cream looks beyond amazing! So creamy and silky smooth. Oh My Gosh!!! All of these ice cream recipes look incredible and I am looking forward to trying many of them!!! 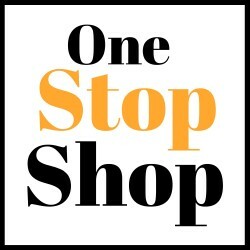 Thanks for sharing so many delicious ice creams. I can never resist a caramel dessert…and your silky smooth salted caramel ice cream looks phenomenal, Tara! Pure decadence…All the recipes look AMAZING!!! Good grief that looks amazing!!! Oh! The Salted Caramel looks amazing! So smooth – very nice! Oh Tara, this looks so perfectly smooth and creamy! This has got to be one of my favorite flavors ever–it’s great on its own, with a dark chocolate shell, or in a cookie. This looks perfectly smooth and delicious! I have to agree Ashley, I love it!! That sounds so good! I always think my favourite flavour is chocolate, but I can never pass up caramel. German Chocolate Cake ice cream! Yummy. Salted caramel sounds amazing. Thank you, it is one of my favs!! I always love the boozy ice creams, like rum raisin, but I’d love to make White Russian (like the Ben & Jerry’s ice cream) because it’s no longer available and it was always my favourite! By the way, your salted caramel ice cream looks perfectly smooth and creamy. Really impressive! Oh my, I haven’t had rum and raisin forever!!! This could be way longer than a week to get my favorites in!! Ice Cream is my favorite dessert. And, I love Salted Caramel, so this is a match made in heaven! Yum. And, it’s been so warm here that it’s totally ice cream weather!